While we often see a lot of tips for how to train a dog to sit, fetch, and do other “tricks” that will help him to be a better member of the household, we don’t usually see cat training tips. However, the truth is that a cat can be trained just as well – if not more – than a dog to do the things that we want them to do. Some training skills are desired because they will stop a certain behavior or prevent an accident from happening. The best training habits for pets are performed with consistency by every member of the household. Before you start training your cat or dog, make sure to schedule a check-up with your veterinarian in South Coast. This will help you make sure that your pet is up for training and does not have any health issues that need to be taken into consideration. Anchor Animal Hospital is located in Dartmouth, and we provide a wide range of veterinary services and preventive treatments for clients in the South Coast area. If you require professional help for how to train a dog or cat, ask your vet about referrals or recommendations based on your specific needs and goals. Both cats and dogs can be frustrating to train, especially if they are young and energetic. Most cat training tips begin by telling the human that they need to have patience because most cats are very independent and stubborn. However, any cat can be trained, as long as you take the time to work with them and get them to understand what you want. Training a five-year-old dog for the first time will be much harder than trying to train a new puppy. Puppies are already busy learning about the world and the rules of your home, so this is also a great time to work on embedding training habits for pets. After your puppy is cleared by a veterinarian in South Coast for vaccinations and check-ups, you can start your training. Kittens should also be trained as young as possible to develop good habits that will last a lifetime. Cats love to bat around toys and dogs love to retrieve things and bring them to their people. 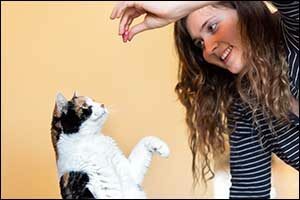 Start by teaching tricks that embrace these natural tendencies and reward your pet with affection instead of treats. Treat-training is a popular method, but when you reward your pet with praise, hugs, and petting – whatever they prefer the most – your results will be more long-lasting and effective. There are some situations when treats must be used to reinforce a skill. While this is more common when learning how to train a dog, many cat training tips also discuss the use of treats. If positive reinforcement with praise and affection is not working or is losing its effectiveness, consider using treats. Get small treats that are designed for training, similar to the size of kibble, but make sure it is something exciting, new and different to get their attention. Discipline is important for pets, but should never be done during training. Cats are worse than dogs when it comes to discipline and will refuse to perform any tricks in the future. Stress is very real for cats, so it is crucial that you pay attention to their stress level. In addition to causing trouble with training, cats under stress can have increased behavioral problems and even health conditions. If you find yourself frustrated, simply take a break. It will be good for both of you to walk away for a little while. Don’t spend hours training your cats or dogs. While they may seem to have a lot of energy, they can quickly become frustrated and lose focus. Keep your training sessions short to twice per day and no more than ten minutes each. This will prevent burn out for both you and your pet. When it comes to building training habits for pets, remember that it can take time. Don’t expect your cat or dog to learn new tricks overnight. Leash training, housebreaking, litter box training, and other essentials should be worked on first before other skills. Teaching your pet to come to you is also key, as it will help you to get them out of dangerous situations in the future. Consider learning other skills at the beginning that will help you keep them safe. Schedule an appointment for a regular check-up to ensure the ongoing safety and well-being of your pet. Cats and dogs require annual check-ups, vaccinations, and preventive treatments to keep them healthy. Anchor Animal Hospital in Dartmouth has been providing top quality veterinary care for family pets since 1975. Give us a call at 508-996-3731 to speak with one of our team members or to schedule an exam.